The pictures just don’t do this sunset justice. Kayla Beshenich from Louisiana State University would probably agree! Check out her blog! When watching the sunset in one of the most beautiful places in the world, make sure to set the camera aside every now and then and focus on what is right in front of you! While having a photo for every moment and knowing that an Instagram post is needed for the day, take in the gorgeous sight through your own lens and not just the camera’s! If you think you are the only group of people who are going to be watching the sunset, you are DEAD WRONG! 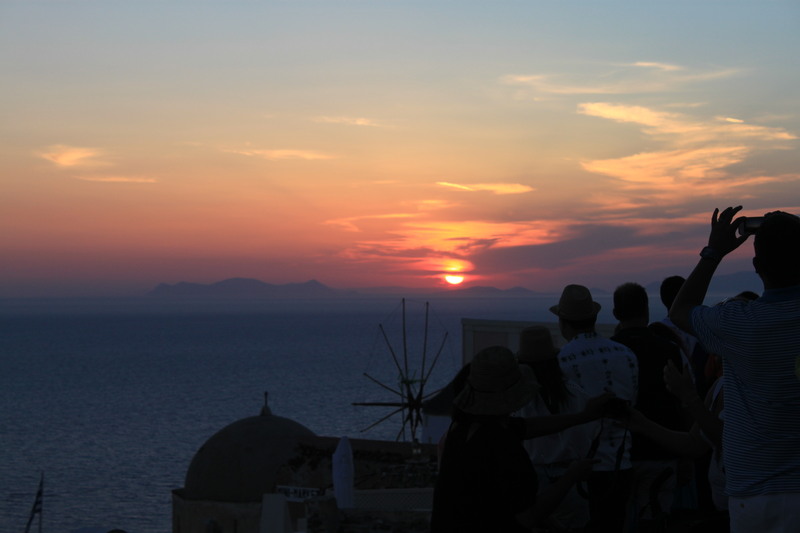 Almost every person that is in Oia at the time will be trying to watch the sunset at the exact same place and time as you are. Picking a place early and hanging out with a bottle of wine or getting a secret spot at a restaurant is the best way to go! The most enjoyable moments should be shared with good company who will take in the beautiful sights with you! Sharing such a special moment with special people in your life will help you to remember the experience for a lifetime!